The ETF to follow in the space is the URA, which holds over twenty Uranium miners with Cameco being the largest holding and sector leader. It is basically what the GDX and GDXJ are to the precious metal miner sector all in one ETF. The ETF began trading at the peak of the last Uranium boom and reached an all-time split-adjusted high less than four months later at over $134 per share. If you thought the precious metal miner bear was bad, during the last six years, URA lost over 90% including two roll-backs! A 1 for 3 reverse split in May of 2013, as well as a 1 for 2 roll-back in November of 2015. This magnifies the potential of buying a basket of U308 miners here with only a small portion of your miner portfolio if the sector has indeed bottomed. I believe the quality miners are still trading at perpetual warrant prices and should be held for long term gains. Uranium is a vital commodity as we head into a rush towards a clean energy revolution. 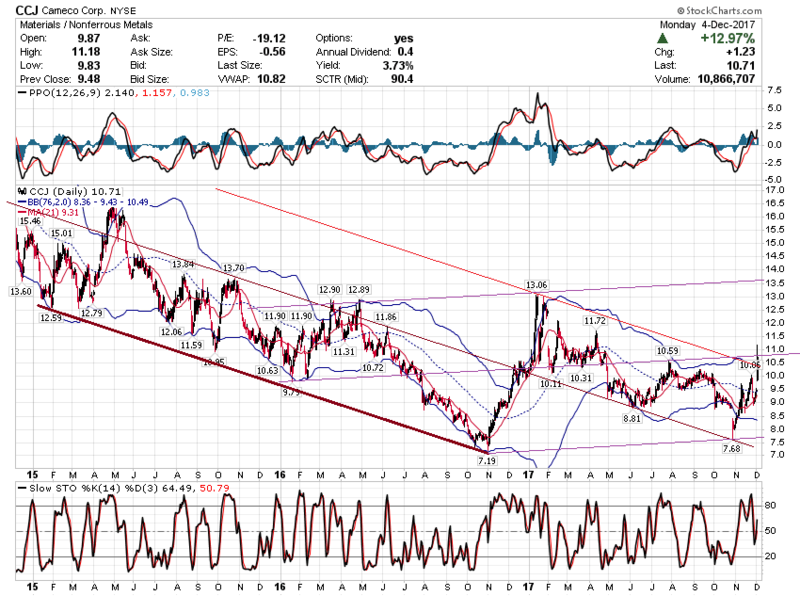 The URA reached the $17 area on Jan. 12 and has had a 50% move off a double bottom reached at the end of October last year. However, I believe we could possibly see the $30 level before beginning a long-term consolidation so weakness should be bought here. 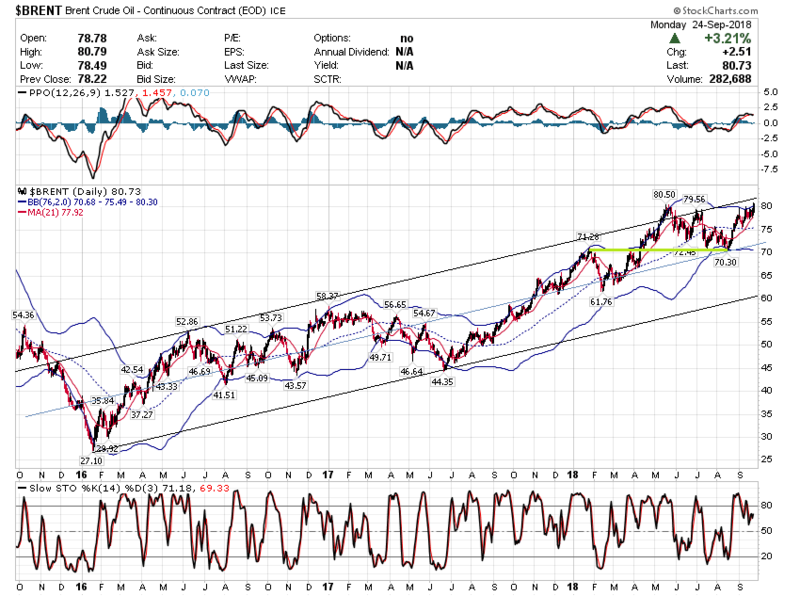 A back-test of the break-out of an 18 month base around the $15 level could happen quickly, so be ready to enter the sector if this area is indeed tested. 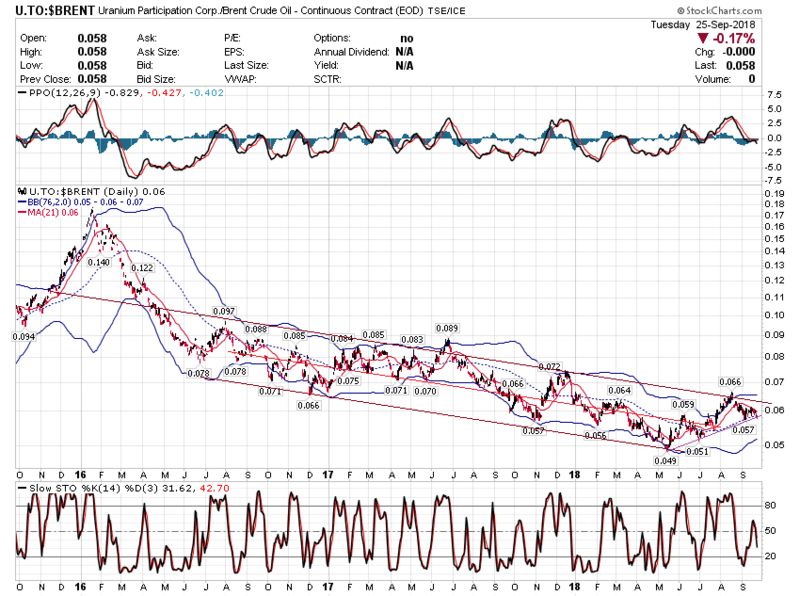 The GDX had a 179% move in six months off the major bottom reached last January, so this move in the Uranium miners has a chance to be equally explosive. The precious metal miner bear lasted just four years and lost 85%. A comparable move in the URA would take the ETF to the $30 level by May before we see a meaningful correction and consolidation! Cameco accounts for approximately 17 percent of global uranium production, and has mines in three countries. In the US it owns the Smith Ranch-Highland operation in Wyoming’s Powder River Basin, as well as the Crow Butte operation in Nebraska. The company’s notable Canadian operations include Cigar Lake and McArthur River/Key Lake, where it holds partial ownership. Additionally, Cameco has a 60-percent stake in a mine in Kazakhstan. So far in 2017, the company has hit at least one snag. In February, Tokyo Electric Power Company Holdings terminated its uranium supply contract with the company, citing force majeure circumstances. Cameco has rejected the termination, and has said it will enforce its rights to recover losses. Terminating the contract could cost the company $1.3 billion in revenue for uranium deliveries through 2028. AREVA produces about 15 percent of the world’s uranium at mines in Canada, Kazakhstan and Niger. Unlike Cameco, the company saw a slight increase in uranium production from 2015 to 2016. Notably, AREVA has a 51-percent stake in the KATCO joint venture. Kazatomprom holds the other 49-percent stake, and the companies are operating the Kazakhstan-based Muyunkum and Tortkuduk mines; together they reportedly cover the world’s largest in-situ recovery uranium mining site in the world. In April 2017, AREVA and Kazatomprom signed an agreement to further strengthen and develop the KATCO partnership. Rio Tinto produced more uranium in 2016 than it did in 2015, and plans to continue increasing production. In its 2016 report, the company says it plans to produce between 6.5 and 7.5 million pounds of uranium in 2017. The company’s uranium output comes partially through the 68.4-percent stake it holds in Energy Resources of Australia (ASX:ERA), which holds the Ranger mine, Australia’s longest continually operating producer of uranium. Rio Tinto also has a stake in Rossing Uranium, which runs the Rossing mine in Namibia; Rossing is one of the world’s largest and longest-running open-pit uranium mines. Paladin Energy’s flagship operation is the Langer Heinrich mine in Namibia, though it also holds the Kayelekera mine in Malawi. The former is currently producing, but the latter is on care and maintenance. While Paladin was a significant uranium-producing company last year, in 2017 it has struggled. Early in the year it proposed a balance sheet restructuring in order to reduce its debt obligations and and extend the maturity of its remaining debt. Since then, CNNC Overseas Uranium Holdings, which bought a 25-percent stake in Langer Heinrich last year, has attempted to exercise an option to acquire the rest of the mine. Paladin has said it plans to enter arbitration with CNNC. BHP Billiton’s Olympic Dam mine in Australia is one of the largest ore bodies in the world. In addition to uranium, it also holds copper, gold and silver. According to the company, Olympic Dam has a fully integrated processing facility. Midway through 2016, the company announced plans for a low-key expansion of the mine over the course of five years. Wondering which other companies produced uranium last year? Companies that produced smaller amounts include Energy Fuels (TSX:EFR,NYSEMKT:UUUU), which put out 1 million pounds (460.4 MT) of U3O8, and Ur-Energy (TSX:URE,NYSEMKT:URG), whose 2016 U3O8 output came in at 538,004 pounds (244 MT). It’s also worth noting that Energy Resources of Australia produced 5.2 million pounds (2,351 MT) of uranium oxide last year. As mentioned, the company holds the Ranger mine in Australia. While mining stopped at Ranger in 2012, the company is currently still producing uranium oxide from stockpiled ore. In 2017 it is forecast to produce about the same amount it put out in 2016. Kazatomprom and Uranium One are also major uranium-producing companies, but are not included on this list because they are privately owned. I was looking at uranium miners on my go to mining aggregator the other day,so I was interested to see this post. Much as I'm a massive believer in solar energy,the reality is that it will be some decades before there's no space or need for reliable sources of electricity eg nuclear,clean coal.For a lot of countries the capital cost of conversion will be prohibitive. Edit to add I was unaware there was an ETF.Whilst I prefer to buy the underlying stock,it's a good reference guide re weightings. I've also put a small sum in Cameco .I think there's a bull market in Uranium inbound. The price of uranium must rise. Right now, uranium trades at around $20/lb. That’s a 12-year low.
. In fact, most producers need $60 uranium to make money. That’s triple the current price. This means the price can only go up from here. But that’s not the only reason to be excited about uranium. Right now, the metal is experiencing the best demand growth in 25 years…but supply is falling short. In other words, producers won’t be able to supply enough uranium to satisfy the coming surge in demand. That’s a recipe for higher uranium prices…and great news for uranium stocks. A buy window is open. Ideal low: Probably during tax-related selling over the next two months. A sensible target for that low would be mid-Nov., based on history. Ur-Energy (TSX:URE,NYSEMKT:URG), whose 2016 U3O8 output came in at 538,004 pounds (244 MT). It’s also worth noting that Energy Resources of Australia produced 5.2 million pounds (2,351 MT) of uranium oxide last year. As mentioned, the company holds the Ranger mine in Australia. While mining stopped at Ranger in 2012, the company is currently still producing uranium oxide from stockpiled ore. In 2017 it is forecast to produce about the same amount it put out in 2016.
the price is currently down around 25% from the same time last year having plummetted over 40% in 2016 according to a report by Frik Els of Mining.com. 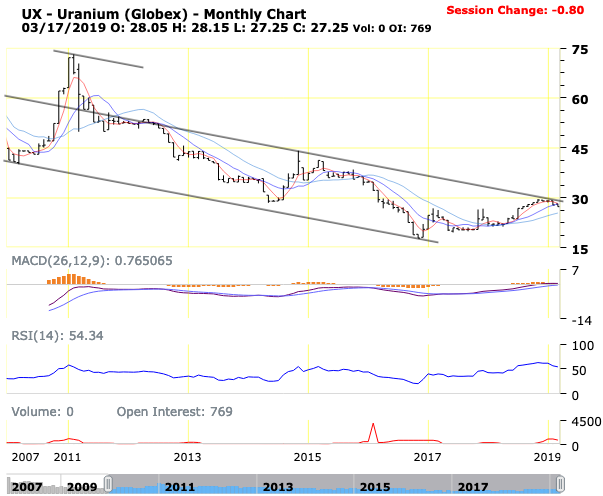 A uranium supply glut and falling demand along with negative sentiment based on a series of events in early 2017 has kept the price low, but analysts are becoming bullish on the medium and longer-term outlooks for uranium despite the metal still technically in a bear market. In January, Kazakhstan, the world’s largest producer, announced that it would cut production by 5.2 million pounds in 2017, which amounts to 3% of global production. The decision was welcomed by markets as a necessary measure to ease the ongoing supply glut. However, a series of events, including Japanese utility Tepco’s cancelling of a key uranium supply contract with Cameco Corp. and the U.S. Department of Energy’s decision to cut uranium dispersion into the market, dampened the enthusiasm following Kazakhstan’s announcement. Nonetheless, Uranium prices have recovered moderately at the outset of Q3 after declining in the preceding quarter. On 7 July, uranium traded at USD 20.1 per pound, which was up 4.4% from the same day in June. The price was 0.7% lower on a year-to-date basis and was down 24.2% from the same day last year. Demand is expected to firm up on the back of favorable supply and demand dynamics. New nuclear facilities are expected to become operational in the coming years and substantial output curbs will contribute to reducing the supply glut in the market and push prices higher. 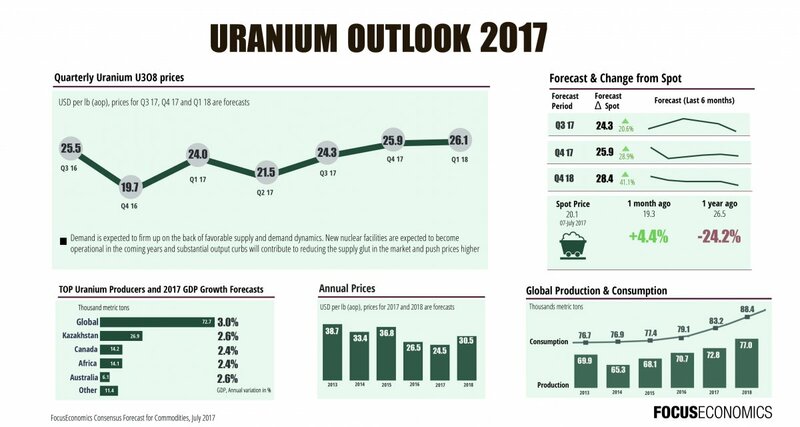 FocusEconomics projects that Uranium prices will average USD 25.9 per pound in Q4 2017 and USD 28.4 per pound in Q4 2018. Mar 14, 2017 - Uranium price graph adjusted to inflation points to spot price of $35-$41 in near future. ... Models point to shortage in uranium in 2017-2018. In fiscal 2017, the uranium industry continued to face challenges as uranium prices endured their sixth consecutive year of bear market conditions, which emerged following the Fukushima incident in March 2011. The uranium spot price dropped 44% during the fiscal year, starting out at US$32.15 per pound U3O8 at the beginning of the fiscal year, hitting a 12-year low of US$18.00 per pound U3O8 in November 2016 and recovering slightly to US$22.25 per pound U3O8 at fiscal 2017 year end in February 2017. The depth and breadth of this uranium market downturn has finally begun to take a meaningful toll on the production side of the supply and demand equation, with production cutbacks becoming the norm as higher priced legacy long term contracts begin to fall off. Uranium prices in the low US$20.00 per pound U3O8 range are unlikely to be sustainable, given that the all-in production costs of the lowest cost producing mines, as reported by UxC, are higher than the current depressed price level. Further, the current price environment fails to incentivize the majority of undeveloped uranium projects towards construction. The state-owned company runs the open-cut Somair mine outside the northern, desert town of Arlit and the giant underground Cominak mine nearby. “The managing director (of Cominak) told us there would be severe restrictions, without giving details,” Amadou Miou, the head of the Arlit section of the Synamines union, told Reuters. “There will also be a reduction in production from 1,400 tonnes to 1,100 tonnes from January,” he said. Trend News Agency quoted Kazakhstan Energy Minister Kanat Bozumbayev as saying that the country has already achieved ambitious production cuts this year. With Bozumbayev noting that countrywide output was reduced by 10 percent during the first 9 months of 2017. The Minister added that this drop should put Kazakhstan on course for a 10 percent reduction in output for 2017 as a whole. Which would mean a reduction of about 2,500 tonnes of uranium (5.5 million pounds), given that 2016 production came in at 24,600 tonnes. Dual-listed Laramide Resources has announced a maiden inferred resource for its Church Rock in-situ recovery (ISR) project, in New Mexico. Prepared by Roscoe Postle Associates, in Denver Colorado, with the assistance of Laramide's technical team, the technical report calculated a compliant inferred resource estimate of 33.9-million tons at an average grade of 0.075% uranium equivalent, for a contained resource of 50.8-million pounds of yellow cake. "As a country, we are not lacking in uranium resources," Yu, at CGNPC, said. "What we need is advanced exploration methods." Low prices in the past five years have seen China stockpile uranium reserves. Li Ning, dean of the School of Energy Research under Xiamen University, felt it made sense for the world's second largest economy to import more uranium. "But domestic supplies are also substantial," Li said. "China has large verified deposits and rising demand will not impact the price since the market is oversupplied." In the 13th Five-Year Plan (2016-20) for energy development, nuclear power facilities generating more than 30 million kilowatts were slated to be constructed in China. By 2020, the world's second largest economy expects to have 58 gigawatts of installed nuclear power, an increase of 16.5 percent year-on-year. "The country will continue developing nuclear power safely and efficiently, while speeding up the construction of nuclear projects along the coastal regions," the development plan stated. Ten nuclear reactors were added to the global grid during the 2016 calendar year, exceeding the mark set in 2015 for the highest rate of growth of nuclear power capacities in the past 25 years. The World Nuclear Association ("WNA") reports that 447 reactors are operable in 30 countries as of March 2017. These reactors generate 392 gigawatts of electricity and supply over 11.5% of the world's electrical requirements. Currently, 59 nuclear reactors are under construction in 14 countries with the principal drivers of this expansion being China (21), Russia (7), India (5), the USA (4), and the United Arab Emirates ("UAE") (4). Additionally, based on the most recent statistics from the WNA, there are a total of 164 reactors that are either on order or planned, and a further 350 reactors currently proposed to be built in the coming years. China continues to be a leader in this growth story, expanding from the currently installed 31 gigawatts of capacity from 30 reactors to close to 100 gigawatts within 10 years, which will exceed the currently installed U.S. capacity. The Chinese government has increased its emphasis on nuclear energy as a way to deliver vast amounts of electricity without adding to the severe crisis-level air pollution and carbon emission conditions that exist in China's major cities. As a case in point, in 2017, China is expected to add five nuclear units to the grid and is expected to break ground on an additional eight reactors. New nuclear countries, such as the UAE, continue to make progress in their new build programs -- most notable are the four new South Korean-built units at the Barakah site in Abu Dhabi, which are all under budget and on schedule to be producing electricity by 2020. Many of the established nuclear markets are also committed to building and operating new nuclear energy stations, like the United Kingdom, where the government's current energy policy calls for a doubling of the installed capacity in the coming years through cooperation with French and Chinese partners. The United States has seen challenges to its growth plans, particularly in de-regulated markets, from highly subsidized renewables and sustained low natural gas prices; however, recently there have been positive developments towards the recognition of the value of nuclear energy in the overall energy mix, with its fuel cost advantages, grid stability, reliable 24/7 supply, 95% capacity factors, and clean air and carbon avoidance attributes. A number of states have introduced legislation, or are considering similar steps, to ensure the preservation of nuclear energy as a key contributor of clean, baseload energy to their grids. In the regulated markets of the Southeast, four new large reactors are under construction in South Carolina and Georgia, which, despite construction challenges inherent in projects of this massive scope, will be the energy cornerstones of their service territories for many decades into the future. Furthermore, throughout the United States, all existing nuclear reactors have received, or are applying for, license extensions that will add 20-40 years to their operating lives. Finally, the Japanese recovery, while slow and deliberate, now has 12 units approved by regulators for restart and as many as seven reactors could be back on-line by the end of 2017. Although slower than expected -- six years having elapsed from the events of Fukushima -- such a development would be viewed as a positive development for both market fundamentals and sentiment in the uranium industry. The world's fleet of operating reactors, and those nearing construction completion, are now expected to generate a cumulative fuel requirement of 174 million pounds of U3O8 in 2017. The fuel requirement level is forecasted to grow at an average rate of 2% to 2.5% per year from the end of 2016 through 2030 according to UxC. While the demand for uranium is fairly steady and predictable, the procurement decisions of utility companies can vary based on the level of current contract coverage, existing inventories, forecasts of future prices and risk tolerance. The previous contracting cycle, brought on by uranium price spikes in 2007 and 2010, resulted in utilities rushing to contract at higher prices and for very long terms. While these old contracts are expiring, the utilities have not been moving to replace these contracts and the forward coverage of utilities have therefore fallen appreciably, resulting in uncommitted needs continuously building. UxC reports that these unfilled needs may total just under one billion pounds of U3O8 over the coming ten years and over 81% of expected reactor requirements are uncovered by 2027. The price of uranium is a little over $20 right now, and in the past year it has been at lows not seen in more than a decade. There are concerns of oversupply, and demand for uranium has been low since the Fukushima nuclear disaster took place in 2011. However, earlier this year, some analysts were expecting a return to $30 in a few years and $50 in five. The problem with predicting any commodity price is that expectations can change in a short period of time. Unfortunately, much like struggling oil and gas stocks, the success of Cameco’s stock price will be linked to a commodity price. 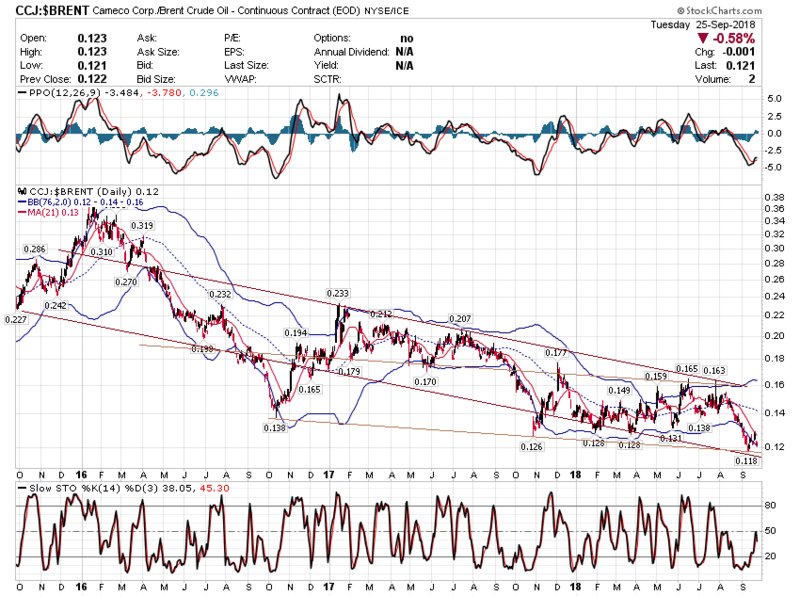 It is for that very reason that Cameco has some risk, but it has a lot of potential upside as well. 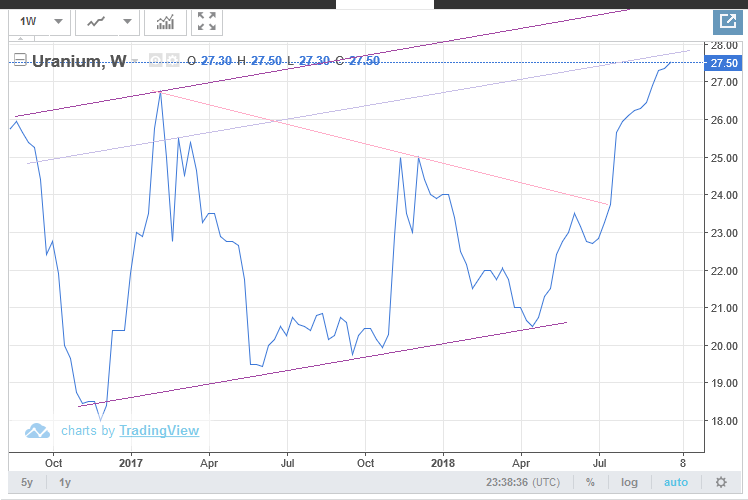 Given how much the price of uranium has dropped in just two years (44%), it is hard to imagine much more of a decline happening. Not only could Cameco see a rise in price if uranium prices increase, but also if the company has a favourable result from its dispute with Tokyo Electric Power Company Holdings Inc., which cancelled a contract. Cameco says the cancellation is without basis. Although the dispute is still ongoing, a lot of investors have likely assumed the $1.3 billion contract is gone, and a positive result could see the stock make a big jump in price. If uranium prices continue to drop, then Cameco is still not hopeless. The company currently pays a dividend of 3.4%, and if times get tough, the payout could be reduced or even eliminated. However, a strong balance sheet gives Cameco some flexibility with what it decides to do. Its debt-to-equity ratio is a manageable 0.29, and its current ratio of 5.8 suggests there are no short-term liquidity risks. Cameco has also grown its free cash flow in each of the past three years, and in the past four quarters, it has accumulated $605 million. By having lots of free cash and strong liquidity on its books, the company puts itself in a good position to handle difficult times ahead. Should you buy Cameco today? Despite the doom and gloom for uranium prices, Cameco does not strike me as a company with significant risk. Although uranium prices are low, there are many factors that could impact demand and that could change the outlook significantly. The stock currently trades at 90% of its book value and could be a great buy for value investors that are willing to take on some risk in return for a lot of potential upside. If the company keeps its dividend intact (and with strong free cash flow, it may very well do so), then you could earn a very decent yield, while you wait for demand to drive uranium prices back up. Why Did Cameco Corp. Stock Fall 9% Yesterday? Is Cameco Corp. a Good Contrarian Bet? Should Cameco Corp. or Suncor Energy Inc. Be in Your Portfolio? Cameco Corp. (TSX:CCO)(NYSE:CCJ) is one of the largest uranium miners in the world, but the company’s commanding position in the market is often overshadowed by the long-standing weakness plaguing the uranium market as a whole. Uranium is used primarily for fuel in nuclear power plants. Back in 2011, uranium prices were hovering near US$70 per pound, and demand for nuclear power was strong. But when a tsunami caused by an earthquake damaged the Fukushima reactor in Japan, demand for uranium and, by extension, nuclear power plants came to a sudden halt, creating a surplus of uranium, and leaving Cameco holding a growing inventory of a product that nobody wanted. Uranium prices have since dropped to US$20 per pound, which has decimated the market. Cameco and other uranium miners have been forced to cut costs and streamline operations to only the most cost-efficient of facilities until the market improves. 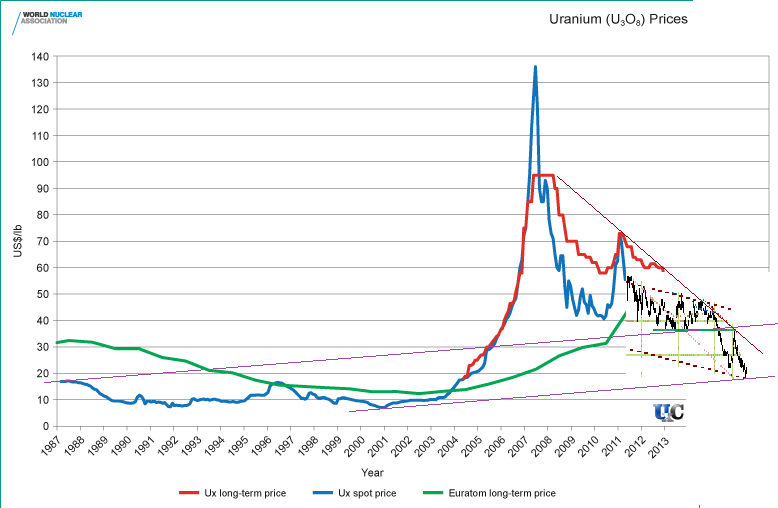 Is the uranium market really improving? Pundits have been calling for renewed interest in uranium for several years, and much of that is coming from the rapid development underway in emerging economies. India and China have aggressive growth targets and are undergoing massive infrastructure booms, which have massive power demands. India has targeted a staggering 14.6 GW of capacity to stem from nuclear power sources by 2024, and that capacity target rises to 63 GW by 2032. Looking further out, India has set 2050 as the year when a quarter of all electricity in the country will be generated from nuclear power. China already generates 32.4 GW of power from nuclear power plants, but within the next three years, that figure is set to hit 58 GW. Looking longer term, China plans to have a nuclear-powered capacity of 150 GW by 2030. In total, there are over 50 new reactors under construction around the world, and at least that many in various stages of planning and approval. Where does Cameco’s revenue come from? Investors contemplating an investment in Cameco are often left wondering how the company has been able to survive and continue to pay out a respectable dividend with a yield of 3.2% over the past few years while uranium prices have continued to drop. Apart from Cameco’s mining operations, which comprised over two-thirds of the company’s revenues in the past fiscal year, Cameco operates two other segments: a fuel services business as well as a middleman buyer/seller operation called NUKEM. Despite the obvious reliance of these segments on the still-depressed price of uranium, Cameco has other things that make it a compelling investment opportunity. First is the company’s dominant position in the market, which has allowed it to reach sufficient economies of scale through cost cutting and shuttering more expensive and less productive facilities, at least until such time that the market recovers. Another factor is the nature of Cameco’s business. The uranium that Cameco mines is used as the fuel for nuclear power plants, sold through what are typically long-term contracts. Those contracts have shielded Cameco from the full effect of the drop in uranium prices, as they carry much higher and locked-in uranium prices. Cameco is an intriguing opportunity for investors, particularly over the long term. On one hand, the uranium market is set to grow thanks to the infrastructure developments underway that will clear up the supply glut and drive prices higher. Looking beyond the demand from emerging economies, the developed world is set to steadily replace or upgrade existing nuclear facilities over the next decade to meet their growing power demands. This often overlooked but could provide additional revenue for Cameco. On the other hand, the prolonged weakness in uranium prices, coupled with the fact that many of Cameco’s long-term contracts are coming due within the next few years, puts Cameco in a time-sensitive position, which may ultimately be too risky for most investors. 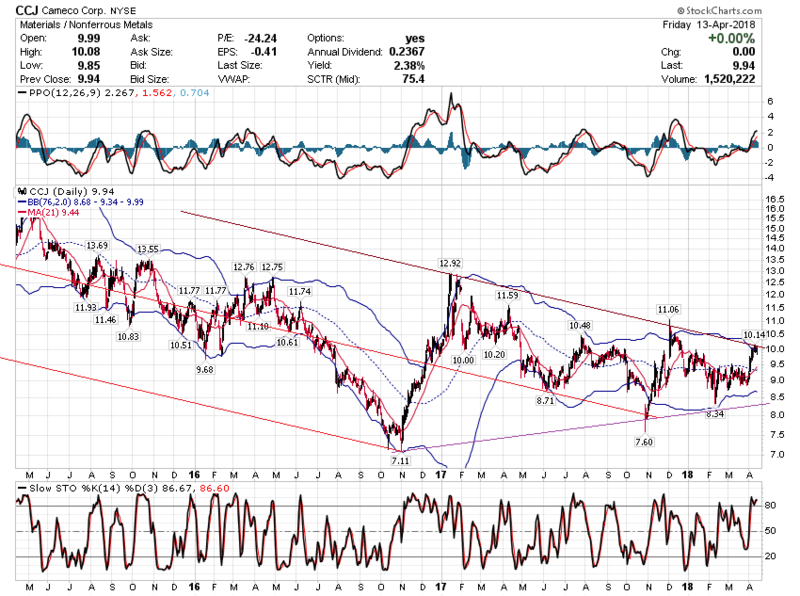 In my opinion, investors that can tolerate short-term risk would do well with a small position in Cameco and benefit from the 3.2% yield dividend while waiting out the recovery of uranium prices. Uranium sold for $73 a pound right before Japan’s March 2011 Fukushima Daiichi nuclear disaster. Now it goes for around $20. As you might guess, much of that decline has been driven by Japan’s rejection of nukes for power generation since then. Now, though, it might be time to “nuke” your portfolio with exposure to uranium, which is shaping up to be a contrarian’s dream. Current uranium prices are “neither rational nor sustainable,” says Cameco CCJ, -0.22% CEO Tim Gitzel. OK, he’s got a dog in this hunt. He’s the CEO of a company with some of the biggest uranium mines in the world, or the McArthur River and Cigar Lake properties in Saskatchewan. Japan is bringing reactors back online. China, with its horrendous pollution problems caused in part by coal-fired power plants, plans to build nuclear reactors aggressively. And China is not alone. Around the world “there are 57 reactors under construction, the majority of which could be online over the next three years,” says Gitzel. Since nuclear power plants buy much of their long-term uranium supply early on, this rush of new reactors could drive up uranium prices significantly over the next few years. five reasons why uranium prices may move higher from here, and two ways to play the trend. ...As of February, there were over 60 reactors under construction in 15 countries, over 160 power reactors planned and over 300 proposed, says WNA. Energy demand will go up 44% by 2030, predicts the U.S. Energy Information Administration. Most of that new demand will come from developing countries. It might make for an uneasy alliance, but many environmental activists concerned that carbon emissions damage the atmosphere may be tempted to embrace nuclear power over coal-fired plants. Even natural gas, billed as a “clean” alternative to coal, has its problems. It’s really not all that clean, given how much of it escapes in production. “Nuclear is increasingly attractive as air pollution and climate change problems become more urgent each year,” says Gitzel, at Cameco. Kazakhstan, which produces 40% of the world’s uranium, says it plans to cut its uranium output by 10% in 2017. Cameco has announced production cuts for this year. Other uranium producers are under serious financial strain and struggling to survive. All of this suggests possible supply constraints if demand picks up. You can’t buy uranium as an investor. So you have to go with uranium mining companies to get exposure to any increase in uranium prices. Just be careful. The world of uranium mining is full of overly promoted companies that are thin on production prospects and long on debt, says Winmill, of the Midas fund. Better to go with a higher-quality company that has known mining assets. This means Cameco, one of the largest and lowest-cost producers in the world. The company says it accounted for about 17% of the world’s production last year, and that it has some of the highest quality deposits around. On July 27, 2017 Cameco reported its consolidated financial and operating results for the second quarter ended June 30, 2017 in accordance with International Financial Reporting Standards (IFRS). “I am very pleased to announce that we have settled our tax dispute with the United States Internal Revenue Service (IRS) for the years 2009 through 2012,” said president and CEO, Tim Gitzel. “We are required to pay about $122,000 (US), compared to the originally proposed tax expense of $122 million (US). We are encouraged by this outcome as we believe it confirms, from an IRS perspective, our view that our structure and transfer pricing arrangements are appropriate. “We continue to face difficult market conditions, with the average year-to-date uranium spot price down 13% compared to the 2016 average. TORONTO — Shares of Canadian miner Cameco Corp. (TSX:CCO) soared in trading Monday after a rival uranium producer announced plans to cut production. Kazakhstan’s state-owned Kazatomprom announced it plans to reduce uranium production by 20 per cent for three years, starting in January. Kazakhstan is one of the world’s largest uranium producers. Shares of Saskatoon-based Cameco were up $1.69 at $13.73 in afternoon trading. The stock hasn’t closed above $14 since late April. Uranium prices have struggled since the earthquake and tsunami that caused the Fukushima Daiichi nuclear disaster in Japan in 2011. Cameco announced plans last month to temporarily suspend operations at its McArthur River mine and Key Lake milling operation in Saskatchewan by the end of January. Cameco (TSX:CCO) (NYSE:CCJ) today reported its consolidated financial and operating results for the second quarter ended June 30, 2018 in accordance with International Financial Reporting Standards (IFRS). “Our results reflect the impact of a weak uranium market and the deliberate actions we have taken driven by the goal of increasing long-term shareholder value,” said Tim Gitzel, Cameco’s president and CEO. “We continue to expect to generate strong cash flow this year as we draw down inventory and focus on operating efficiently. However, we have not seen the improvement needed in the uranium market to restart McArthur River and Key Lake. “This means we will extend the suspension of production at McArthur River and Key Lake for an indeterminate duration. It was a difficult decision to make, because of the impact it will have on our employees, their families, and other stakeholders, but we must take this action to ensure the long-term sustainability of the company. We thank our workforce for their hard work and dedication. “We believe our assets are among the best in the world, and we will continue to show the type of leadership needed to position the company to add significant value over the long-term. We will not produce from our tier-one assets to deliver into an oversupplied spot market. Until we are able to commit our production under long-term contracts that provide an acceptable rate of return for our owners, we do not plan to restart. Updated annual outlook: We have made the following updates to our 2018 financial outlook table in our second quarter MD&A: our consolidated revenue is expected to be between $1,890 million and $2,140 million; in our uranium segment we expect our delivery volumes to be between 34 million and 35 million pounds, revenue of between $1,550 million and $1,640 million, an average realized price of $46.10 per pound, and our average unit cost of sales between $40 per pound and $42 per pound. Cameco just rattled the uranium market… again. Cameco, as you may know, is the world’s biggest publicly traded uranium producer. Last November, it suspended operations at its flagship McArthur River Mine and Key Lake Mill complex. The shutdown went into effect in January. It was supposed to last 10 months. It was a major announcement, as I explained at the time. You see, the shutdown was poised to remove 13.7 million pounds of uranium production from the global supply—about 9% of production worldwide. Cameco did this because uranium prices were so low that it couldn’t turn a profit. But idling McArthur for 10 months wasn’t long enough. After seven-and-a-half years of declining commodity prices, we had to take strong action. Cameco will lay off about 550 workers at the facility as a result. It will also terminate 150 positions at its corporate headquarters. Brent crude breaches $81 a barrel — its highest level since November 2014 — on the back of a tightening oil market and OPEC leaders signaling they won't be immediately boosting output. The market is growing concerned about undersupply as U.S. sanctions on Iran threaten to reduce supply by about 1 million barrels a day. Meanwhile, U.S. West Texas Intermediate crude rose $1.30, or 1.8 percent, to $72.08, its best settle since July 10. Brent first hit a new four-year high in early morning trade. Oil prices extended gains at midday, and the contract's settle above $80 a barrel positions Brent for a breakout, said John Kilduff, founding partner at energy hedge fund Again Capital. "From there then you could see a greater push higher, really to $83 or $85," he said. "That should engender follow-through buying." J.P. Morgan wrote in its latest market outlook that "a spike to $90 per barrel is likely" in the coming months thanks to U.S. sanctions on Iranian oil exports, which have fallen dramatically in recent months as importers brace for the impending penalties. The bank forecasts Brent and U.S. benchmark WTI prices to average $85 and $76 per barrel, respectively, in the next six months.